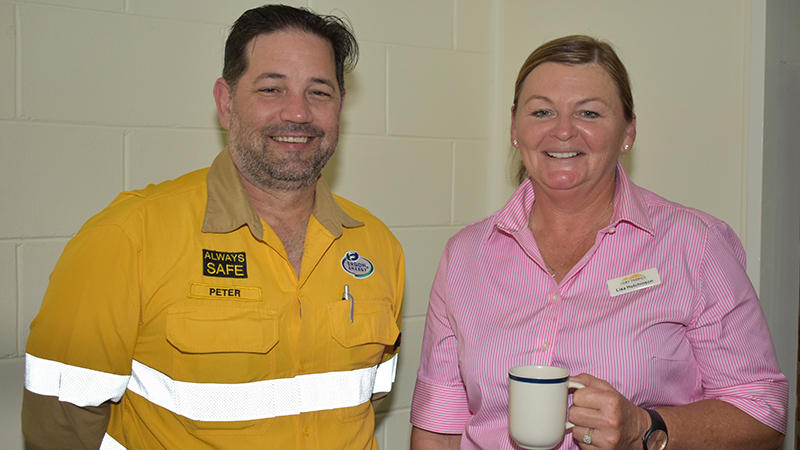 EIM Pipeline Supervisor-Northern Anatol Stremouchiw with NQ Dry Tropics’ Landholders Driving Change Project Manager Lisa Hutchinson. 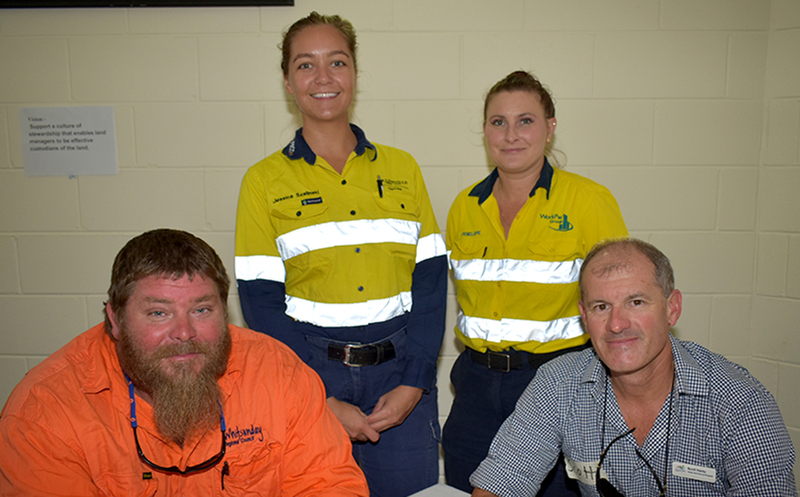 At the Collinsville forum, back, Jessica Szalinski, Glencore, and Penelope Davis, Glencore, with Lindsay Mackie, Whitsunday Regional Council Works Supervisor Collinsville and Whitsunday Regional Council Manager Natural Resources Management Scott Hardy. PREVENTING and managing erosion isn’t just an issue for graziers, but one for all land managers including utilities, mines, local councils and government departments. Through its Landholders Driving Change project, NQ Dry Tropics is facilitating cross-sector collaboration in the Bowen Broken Bogie (BBB) catchment, around Bowen and Collinsville, to support a culture of stewardship that enables all land managers – grazing and non-grazing – to be effective custodians of the land. Landholders Driving Change, a Queensland Government funded major integrated project, aims to tackle erosion and improve land management, productivity and water quality around Bowen, Collinsville and Eungella. Two forums were held in Eungella and Collinsville in March for utility companies, mines, government departments and local councils. The aim was to come up with ideas on how to create shared accountability to adopt best practice when carrying out ‘land-disturbing activities’ such as constructing and maintaining rural roads, rail corridors, transmission pipelines, and poles and wire that transport power to homes and businesses. The BBB catchment area is considered a high priority, having high rates of sediment loss compared to other sub-catchments in the Burdekin Dry tropics region. LDC project manager Lisa Hutchinson said the poorer soils around Bowen and Collinsville mean erosion was a problem for the region. “Graziers have been involved with the LDC from the start, designing and implementing ways to tackle erosion and improve land management, productivity and water quality,” Ms Hutchinson said. “It’s now time to ramp up work with the rest of the land managers in the region because it has been identified that erosion and sediment control is a significant challenge for all land managers. “The forums were positive and productive, with representatives from Ergon Energy, Powerlink, EIM, and Whitsunday Regional Council attending. “Participants agreed to establish a set of standards for common erosion mitigation techniques that apply to all stakeholders,” she said. Anatol Stremouchiw, EIM Pipeline supervisor-Northern, said he appreciated the opportunity to meet representatives from other organisations who worked in the region. “The meeting allowed participants to find out what the bigger picture visions are for the LDC project,” Mr Stremouchiw said. “Everyone appears to be interested in finding out what best practice is for the region and sharing the knowledge they have,” he said. A centralised communication portal for land managers in the BBB will be developed to create awareness of stakeholders’ planned works and activities in the BBB, and to facilitate access to technical expertise and peer input. Public forums will also be held to inform the BBB community. These non-grazing land managers, along with representatives from National Parks and Wildlife, and contract machinery operators, also sent 31 participants to attend Darryl Hill workshops held at Eungella Station and Collinsville last month. Mr Hill is one of only a few qualified instructors who runs workshops for soil conservation in Australia. Through both theory and practical demonstrations, land managers gained correct knowledge, skills and management tools to understand the causes of soil erosion, how to avoid triggering additional erosion and how to ameliorate existing erosion. 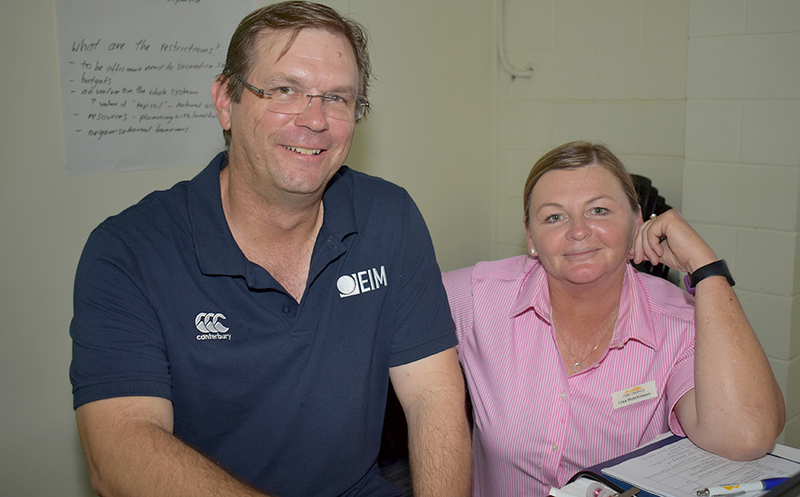 Ergon Team Leader Peter Gorrie with NQ Dry Tropics’ Landholders Driving Change Project Manager Lisa Hutchinson at the Collinsville forum held for land managers who work in the Bowen and Collinsville region.